Today, President Trump engaged in an egregious and dangerous abuse of power by declaring a national emergency at the U.S.-Mexico border, circumventing the border legislation that was passed by overwhelming bipartisan majorities in Congress. WOLA staff have been visiting the U.S.-Mexico border since 2011, and are in Tijuana-San Diego right now following the situation on the ground closely. The facts on the ground are clear—there is no national security emergency at the border. Drugs. On average, 130 American die every day from opioid overdose. The opioid crisis is certainly warrants more resources and innovative approaches. However, Trump administration claims that building a wall will stem the flow of illegal drugs are false. Hard drugs that devastate communities in the United States are almost exclusively trafficked through land ports of entry and would not be stopped by a physical barrier. Crime. The Trump administration has misled the American people about security conditions at the U.S.-Mexico border: the majority of those apprehended at the border—60 percent so far this year—are either families or unaccompanied children from countries in Central America. In fiscal year 2018, less than one percent of those apprehended at the southern border had a record of violent crimes. As WOLA has documented, terrorists, gangs, and spillover violence represent a negligible threat at the border. Indeed, by refusing to invest in a more efficient asylum system, Trump administration policies are likely to be strengthening and emboldening criminal networks by increasing the demand for human smugglers’ services. The humanitarian crisis. This is a problem of the Trump administration’s own making, by pursuing cruel and draconian enforcement measures rather than taking the steps needed to adjust to the new reality of migration at the border. Practices like “metering”—in which only a few asylum seekers are processed by border officials each day—have created a massive backlog of people (many of whom likely have strong claims to asylum) in Mexican border cities like Tijuana. This backlog will only get worse as the Department of Homeland Security starts returning some asylum seekers to wait out their U.S. immigration court cases in Mexico, a country that registered its most violent year ever in 2018. The new reality of migration at the border consists of unprecedented numbers of asylum-seeking children and families, even as migration levels remain at record lows overall. These people are deliberately seeking out border authorities in order to make their asylum claims; no physical barrier like President Trump’s wall is going to deter them. $58 million for 600 new CBP officers at official ports of entry. While there are big downsides to rapidly increasing the manpower of an agency with insufficient accountability, the ports of entry are overwhelmed. More CBP officers could help reduce border-crossing wait times, reduce “metering” of asylum-seekers, and interdict more opioids and other drugs. $600 million for new technology at ports of entry, which also includes more scanning equipment and detection dogs. This is sensible, as well over 80 percent of all border drug seizures (except cannabis) are seized at ports of entry. $192 million for food and medical care for migrants in CBP custody. This includes $128 million for medical personnel, $40.2 million for food, infant formula, and diapers; $24.5 million for transportation between facilities. Members of Congress who’ve visited the border were shocked by detention conditions. This portion of funding is Congress taking action to address that. $192 million for a new short-term CBP migrant processing facility in El Paso, Texas, as well as $30 million for improvements to the one in McAllen (the infamous facility that kept asylum-seeking kids and families in chain-link cages). 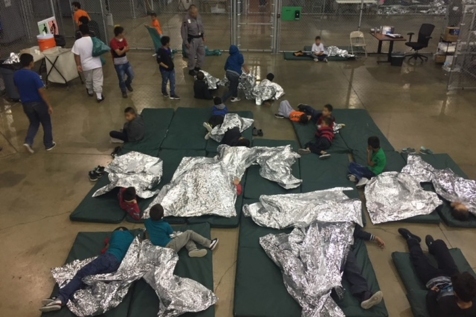 The border deal also specifies that temperatures need to kept at appropriate levels (this addresses the widespread reports of “freezing” conditions), no more chain-link cages, and no more foil sheet blankets. These are all much-needed improvements to the terrible, degrading, inhumane conditions widely documented in detention facilities, particularly the one in McAllen. $1 million for rescue beacons for migrants lost in the desert. This is urgently needed, given the rising number of people dying from extreme heat or other causes in the desert. Border officials counted 281 deaths for the 2018 budget year, according to government documents viewed by ABC News. The border deal urges—but does not fully require—CBP to keep unaccompanied siblings together. The deal requires Custom and Border Protection to brief Congressional committees about improvements in procedures for welfare of migrants in CBP custody. (While this is welcome, it’s unfortunate that these briefings aren’t public hearings). Customs and Border Protection will now face tougher reporting requirements on use of force allegations, drug seizures, checkpoint operations, roving patrol stops, and deaths in custody. While more reporting is good for accountability, CBP needs to submit these reports on time. The deal passed by Congress and signed into law has some major objectionable provisions and omissions. It includes funding for additional beds in detention centers—a move that is unlikely to lead to any reduction in the Trump administration’s ability to detain large numbers of migrants, and will continue the inhumane and draconian deportation policies that are having a devastating effect on immigrant communities. It does nothing to resolve the legal limbo facing recipients of the Deferred Action for Childhood Arrivals (DACA) and the Temporary Protection Status (TPS) humanitarian program. However, declaring a national emergency for the sake of pandering to President Trump’s political base is an egregious abuse of executive power. Not only that, it represents a total failure to acknowledge actual realities at the border. We can only hope that Congress and U.S. courts move swiftly to recognize this power grab as unconstitutional and without basis in reality. Analysis: there’s no national security emergency at the border to justify an authoritarian power grab. Analysis: the U.S. government’s “Migrant Protection Protocols” ignore U.S. legal obligations to asylum seekers and is exacerbating the humanitarian border crisis. (See our joint statement on these protocols, addressed to Secretary of Homeland Security Kirstjen Michele Nielsen, here). Report: challenges for asylum seekers at U.S. ports of entry.